Welcome to the Creative Cuts and More Valentine Blog Hop, I'm so glad you had a chance to stop by today! If you arrived from Holly's Blog, you're in the right spot. If not, no worries after checking out my post, you can always hop back over to the Creative Cuts and More Blog to check out the blogs you might have missed. 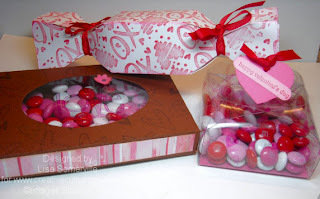 I used a variety of die cuts from Creative Cuts and More to create some fun treat ideas for your Valentine. It's a little hard to capture the stamping on the acetate, so I've included a close up. The Oval Window Box is cut in Bazzill Smoothies Chocolate Cream, I stamped the hearts from Stampin' Up! 's Love You Much randomly in Chocolate Ink on the top panel, and adhered some Pattern Paper (source unknown) to the sides, then assembled the box with Killer Red Tacky Tape. I cut a piece of acetate for the opening, and stampe the image in Black Stazon, coloring with Copics and added a punched flower for accent. The Oval Window Box would also be a great way for Hershey Nuggests. The other acetate box is the Self Closing Box, these go together super quick! The images were randomly stamped in Red Stazon. For added support I cut a piece of Bazzill Watermelon Smoothies to place in the bottom. The Heart Die Cut is also in Bazzill Watermelon Smoothies, with the sentiment stamped in Red on Pink card stock, then punched with Stampin' Up! 's Word Window Punch and adhered to my box with Red Grosgrain. 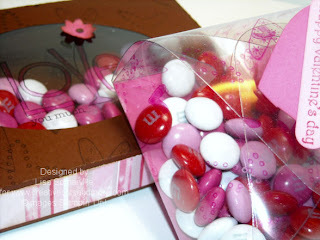 The last project uses the Candy Box Die, here it was cut from White card stock, then wheeled in Red using Stampin' Up! 's Hugs & Kisses Wheel, once assebled with the Kilelr Red Tacky Tape, I tied it closed with Red Grosgrain. Just a note, if you plan on filling the Candy Box, enclose your items in a small Cello Bag, so they don't fall out. This month Creative Cuts and More has a great prize for those of you who'd like to play along. Simply Post a comment on each of the Creative Cuts and More Design Team Members projects for today's Blog Hop and create a Valentine Themed Die Cut project. Upload your project to any online forum using the keyword CCANDM1 (or post to your blog) with a link to http://die-cut-diva.blogspot.com/, then post a comment on the Die Cut Diva Blog with a direct link to your project by Monday, January 18th, for your chance to win a Variety Package of Products ($15 Value) from Creative Cuts and More. We're looking forward to seeing your Valentine's projects using Die Cuts. I hope you've been inspired by my Valentine projects, next up on the hop be sure to visit Jenny's Blog for more Valentine inspiration using Creative Cuts and More's Die Cuts. Those are all so super cute! I might have to check out this website! I have seen the wonderful creations on here using the Creative Cuts & More, and this is just over the top awesome!!!! YUMMY!!!! Love this! The colors are so vibrant and FUN! And those m&m's are looking mighty DELICIOUS!!! Great projects!!! Fab work Lisa! Adorable projects! Wow, three fun diecuts. Great presentation. I love the stamps you used too. Gorgeous valentines!! Great gifts! I love that self closing box. I wish I could see the stamping better. I ALWAYS slide the stamp just enough to ruin it. Great Valentine's projects Lisa! Love them and need to look into Creative Cuts & More!!! Looks like some great products. OOOOOOOOOOOOOH! Those are all SO FABULOUS!!!!!! LOVE THEM!!!!! !